If you believe your iPhone and iPad have been getting slower over time, you’re probably right. 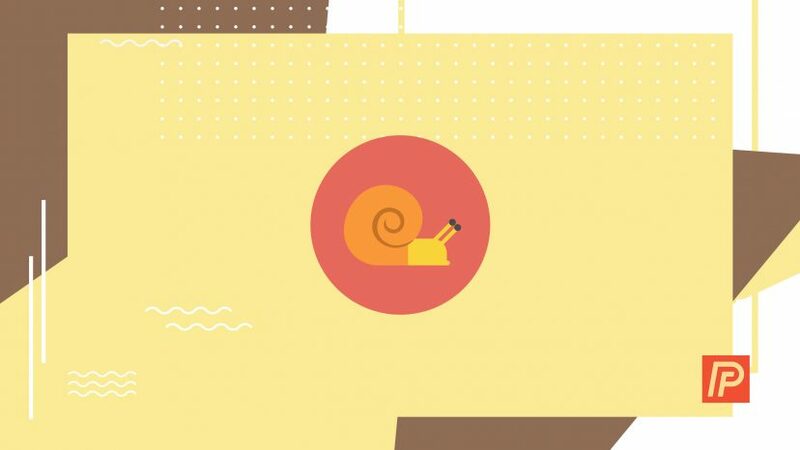 The decline in speed happens so gradually that it’s almost imperceptible, but one day you realize that your apps are responding slowly, menus are sluggish, and Safari is taking forever to load simple websites. 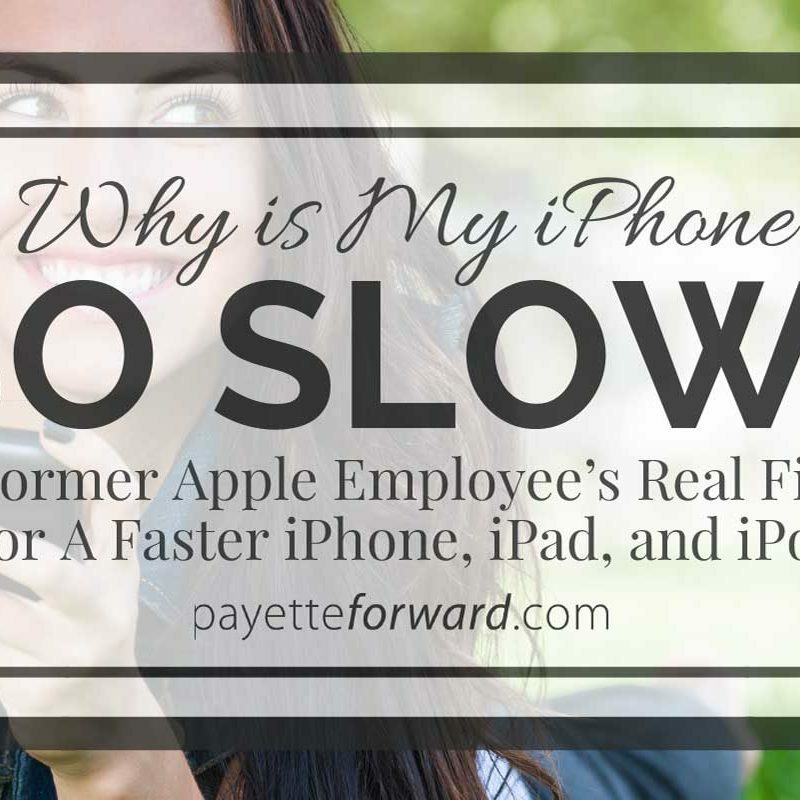 In this article, I’ll explain the real reasons why your iPhone is so slow and show you the fixes that will make your iPhone, iPad, or iPod run as fast as possible. Before We Begin: Should I Just Buy A New iPhone or iPad? New iPhones and iPads have more powerful processors, and it’s true that they are faster than older models. 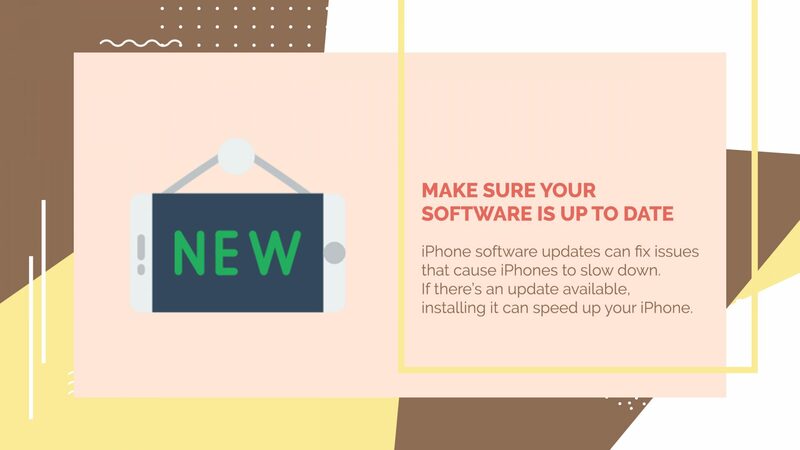 Most of the time, however, it’s not necessary to buy a new iPhone or iPad if yours is running slow. 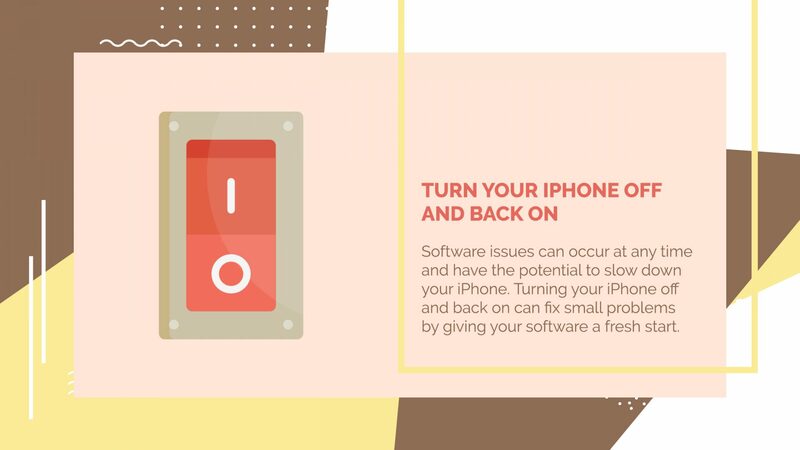 Usually, a software problem on your iPhone or iPad is what’s causing it to run slowly and fixing your software can make a world of difference. That’s exactly what this article is about. All of the fixes I describe in this article work equally well for iPhones, iPads, and iPods, because they all run Apple’s iOS operating system. As we’ll discover, it’s software, not hardware, that is the root of the problem. Like all computers, iPhones have a limited amount of storage space. The current iPhones come in 16GB, 64GB, and 128GB varieties. (GB stands for gigabyte, or 1000 megabytes). Apple refers to these storage amounts as the iPhone’s “capacity”, and in this respect, and iPhone’s capacity is like the size of a hard drive on a Mac or PC. After you’ve owned your iPhone for a while and taken lots of pictures, downloaded music, and installed a bunch of apps, it’s easy to run out of available memory. Problems begin to occur when the amount of available storage space reaches 0. I’m going to avoid a technical discussion at this point, but suffice to say that all computers need a little bit of “wiggle room” to keep the software running smoothly. How Do I Check How Much Free Space Is Available On My iPhone? Head to Settings -> General -> About and look at the number to the right of ‘Available’. If you have more than 1GB available, skip to the next step – this isn’t your problem. 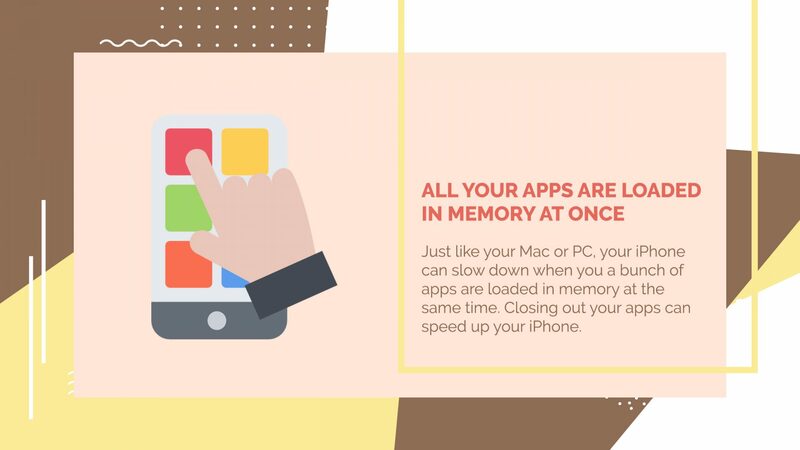 How Much Memory Should I Leave Available On My iPhone? The iPhone is a very memory-efficient device. In my experience, you don’t need much available memory to keep things running smoothly. My advice to avoid a slow iPhone is this: Keep 500MB free at the very least, and 1GB free if you’d like to be totally safe. How Can I Free Up Memory On My iPhone? Fortunately, it’s easy to track down what’s taking up space on your iPhone. Head to Settings -> General -> iPhone Storage and you’ll see a descending list of what’s taking up the most space on your iPhone. Photos have to be deleted using the Photos app or iTunes, but Music and Apps can easily be removed from this screen. For apps, just tap on the name of the app and tap ‘Delete App’. For Music, swipe your finger from right to left on the items you’d like to delete, and tap ‘Delete’. You can quickly optimize your iPhone storage by enabling some of the features underneath the Recommendations submenu. For example, if you enable Auto Delete Old Conversations, your iPhone will automatically delete any messages or attachments that you sent or received over a year ago. What happens if you open a whole bunch of programs at the same time on your Mac or PC? Everything slows down. Your iPhone is no different. I’ve covered this point in other articles, including my article about how to save iPhone battery life, but it’s necessary to address here as well. Whenever you open an app, it’s loaded into the application memory on your iPhone. When you go back to the home screen, the app closes, right? Wrong! When you leave any app, that app has a certain amount of time to go into a suspended state, and theoretically, apps should have very little effect on your iPhone when they’re suspended. In reality, even after you leave an app, that app stays loaded into your iPhone’s RAM. Every model iPhone 6 and iPhone 6 Plus have 1GB RAM. As I mentioned above, the iPhone manages memory extremely well, but having lots of apps open at the same time can cause your iPhone to slow down. Which Apps Are Suspended On My iPhone? And How Do I Close Them? To view the apps that are suspended in memory on your iPhone, double-click the home button and you’ll see the Multitasking view. Multitasking allows you to quickly switch between apps on your iPhone, and it also allows you to close them. To close an app, use your finger to swipe it off the top of the screen. This doesn’t delete the app, but it does clear the app from suspended memory on your iPhone. I recommend closing all your apps at least once every few days to keep things running smoothly. I’ve seen iPhones with dozens of apps suspended in memory, and clearing them out makes a huge difference. Show your friends, too! If they didn’t know all their apps were still loaded in memory, they’ll be grateful for your help. Head to Settings -> General -> Software Update, and if there’s a software update available, download and install it. But can’t software updates cause slowdowns? Bob updates his iPad 2 to iOS 8. It’s really, really slow. Bob is sad. Bob and all of his friends complain to Apple about how slow his iPad 2 is. Apple engineers realize that Bob is right and release iOS 8.0.1 to address “performance issues” with Bob’s iPad. Bob updates his iPad. His iPad isn’t as fast as it once was, but it’s a lot better than before. Not all apps are coded by developers of the same skill. One app running in the background might slow down your iPhone a lot while another might have an indiscernible impact. There’s no good way to measure each app’s impact, but a rule of thumb is that lesser-known apps with smaller budgets may be more problematic than big-budget apps, simply because of the amount of resources needed to develop a world-class app. 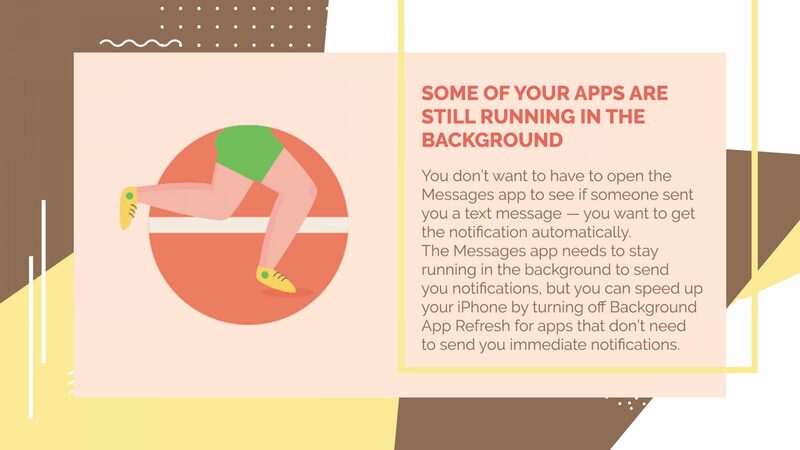 I believe that it’s very important for you to choose which apps you’d like to allow to continue running in the background of your iPhone. Which Apps Are Allowed To Continue Running In The Background Of My iPhone? Head to Settings -> General -> Background App Refresh to see a list of apps on your iPhone that are currently allowed to continue running even when they’re not open. If the answer is no, then I’d recommend you turn off Background App Refresh for that specific app. Go down through the list, and if you’re like me, you’ll only have a select few apps left on by the very end. To learn more about this function, Apple’s support article about Multitasking and Background App Refresh has some good information. Be aware, however, that support articles on Apple’s website tend to be written from an idealistic perspective, whereas I take a more pragmatic approach. Can simply rebooting your iPhone make that much of a difference? Yes! Especially if you’ve completed all of the previous steps, turning off your iPhone (the correct way, not a hard reset) purges the iPhone’s memory and gives it a fresh, clean start. How Do I Reboot My iPhone? To reboot your iPhone, press and hold the Sleep / Wake button (also referred to as the power button) until “Slide to power off” appears. Slide your finger across the display and wait as your iPhone powers all the way off. Don’t be surprised if it takes 30 seconds or so for the little white circle to stop spinning. After your iPhone is off, press and hold the Sleep / Wake button again until you see the Apple logo appear, and then let go. If you’ve completed the steps above, you’ll see a noticeable increase in speed after it reboots. You’ve lightened the load on your iPhone, and your iPhone will show you its gratitude with increased speed. After writing this article initially with five main points, there are a couple less-common scenarios that I feel I need to address. If Safari is running slowly, one of the most common reasons for sluggish speed is that you’ve accumulated lots and lots of saved website data. This is a normal process, but if too much data builds up over a long period of time, Safari can slow down. Fortunately, clearing this data is easy. Head to Settings -> Safari and tap ‘Clear History and Website Data’ and then ‘Clear History and Data’ again to remove history, cookies, and other browsing data from your iPhone. 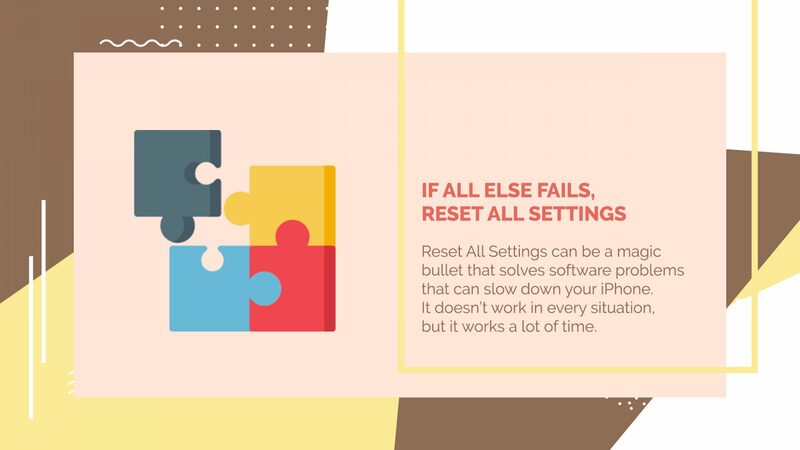 If you’ve tried everything above and your iPhone is still too slow, “Reset All Settings” is often a magic bullet that can speed things up. Sometimes, a corrupted settings file or misconfiguration of a specific app can wreak havoc on your iPhone, and tracking down that type of a problem can be very, very difficult. “Reset All Settings” resets your iPhone and all of your apps to their default settings, but it doesn’t remove any apps or data from your iPhone. I only recommend doing this if you’ve exhausted all of your other options. You’ll have to sign into your apps again, so make sure you know your important usernames and passwords before you do it. If you’ve decided you’d like to give it a try, go to Settings -> General -> Reset -> Reset All Settings to restore your iPhone back to its factory default settings. If you’ve been wondering why your iPhone is so slow, I sincerely hope this article has helped you get to the core of the issue. We’ve gone over the reasons why iPhones, iPads, and iPods get slower with time, and we’ve discussed how to make your iPhone faster. I’d love to hear from you in the comments section below, and as always, I’ll do my best to help you out along the way. Previous ArticleMy iPhone Is Disabled. Connect To iTunes? Here’s The Fix! Next Article Why Is My iPhone Black And White? Here’s The Real Fix!